Llandudno Junction Railway Station Railway StationLlandudno Junction railway station is on the North Wales Coast Line from Chester to Holyhead; it is the junction for the branch line to Llandudno itself and the Conwy Valley Line to Blaenau Ffestiniog. Located off the A546 road from Junction 18 on the A55; the postcode is LL31 9NB. Ticket office open Monday to Friday 05.25 - 18.25, Saturday 06.00 to 19.00 & Sunday 11.00 - 18.30. 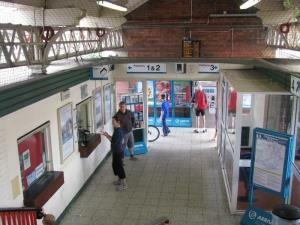 Ticket machine, payphones, refreshments and toilets; waiting room open 06.00 (Sunday 08.00) to 19.00. Live Departure and Arrival screens. Car parking @ £4.50/day - 79 spaces; cycle stands, taxi rank. Services from/to Chester & Holyhead with trains Monday to Saturday during every hour of the day; reduced service on Sundays. A shuttle service connects Llandudno with many of these trains. Most trains originate from/continue to Cardiff or Birmingham via Shrewsbury and Wrexham; others are from/continue to Manchester Piccadilly or Crewe. Also services Monday to Saturday from/to Chester/Llandudno or Llandudno Junction nearly every hour; most of these trains originate from/continue to Manchester Piccadilly or Manchester Airport. In addition there are services on the Conwy Valley Line to/from Betws-y-Coed & Blaenau Ffestiniog. Train times from 9 December 2018 to 18 May 2019 are- Departures Monday to Saturday at 05.30, 07.26, 10.28 (Sat 10.34), 13.30, 16.33 & 19.23 (Sat 19.19). Sundays summer only. Arrivals at 07.20, 09.33 (Sat 09.44), 12.33, 15.55, 18.35 & 21.21. Sundays summer only. Virgin Trains operate daily services from/to London Euston via Crewe and Chester and from to Bangor & Holyhead. Llandudno Junction railway station is on the North Wales Coast Line from Chester to Holyhead; it is the junction for the branch line to Llandudno itself and the Conwy Valley Line to Blaenau Ffestiniog. Located off the A546 road from Junction 18 on the A55; the postcode is LL31 9NB. Ticket office open Monday to Friday 05.25 - 18.25, Saturday 06.00 to 19.00 & Sunday 11.00 - 18.30. Ticket machine, payphones, refreshments and toilets; waiting room open 06.00 (Sunday 08.00) to 19.00. Live Departure and Arrival screens. Car parking @ £4.50/day - 79 spaces; cycle stands, taxi rank. Travelling west on the A55, Junction 18 for Conwy and follow the A546 road for Llandudno Junction; station on right.